Khalil Bendib -- As a Muslim-American political cartoonist who has made a career out of challenging the conventional wisdom of America?s Judeo-Christian, Eurocentric mainstream media, I am understandably reluctant to argue in favor of any restrictions on free speech that might conceivably come back to haunt me. So it is not without some sense of trepidation that I set about explaining why, in the case of the now infamous 12 Islamophobic Danish caricatures, the concept of free speech needs to be outweighed by a sensitivity for the rights of a much maligned religious community. Moroccan and Turkish Muslim populations, which had until recent years been absent in the far northern reaches of Europe, have now arrived in Scandinavia and are starting to feel the bitter sting of classic xenophobic backlash as they become more visible. It is generally accepted, as taught in Journalism 101, that the concept of freedom of expression in a democratic society must always be balanced by the no-less-important notion of social responsibility. Even in the name of free speech, yelling "fire" in a crowded theater is considered reprehensible - as should be yelling contempt in a crowded mosque for that matter. Try as I may while reviewing the infamous Islamophobic Danish caricatures, I fail to discern in them any clear political statement other than the questionable assertion that Islam equals terrorism. 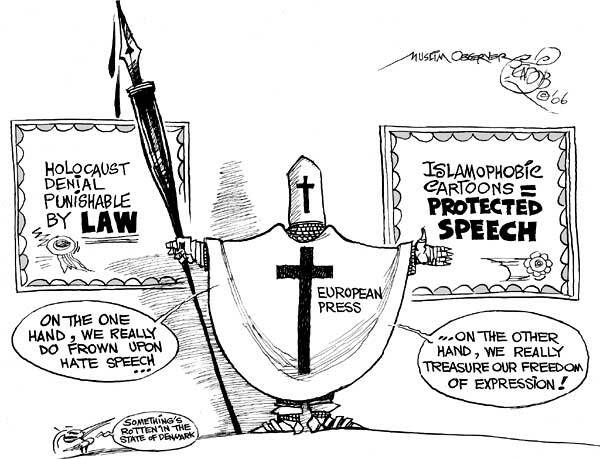 Such a message of religious intolerance is, of course, as old and familiar as the Crusades and the Inquisition in the Christian European psyche, but it should no longer be acceptable in post-colonial Europe, even when couched in terms of "freedom of expression." Publishing deliberately inflammatory caricatures aimed at all that is most tender and precious to the hearts of Muslims worldwide regardless of their political ideology or ethnic background unfortunately helps neither Europe's lofty democratic ideals nor Islam's nagging feelings of victimization and humiliation at the hands of Western media. While regrettable over-reactions such as burning of European embassies and threats of violent retaliation against Western journalists are clearly uncalled for - and only help to validate the worst stereotypes about Muslims - the gratuitous provocations of right-wing European journalism maliciously adds fuel to the fire of already tense relations between the different monotheistic faiths. At a time when Muslim Iraq, Afghanistan and Palestine are all under the crushing boot of foreign Western occupation, reactionary Muslim extremist movements can only be comforted by such blatantly hurtful and racist cartoons. Adding insult to injury, these crude caricatures are in Muslim eyes only the latest sign of the West's utter contempt for their dearest values and traditions - the humiliation of non-European people having been, for the past five hundred years, an essential feature of Western colonialism and enslavement. Many Muslims are also rather skeptical when told that in this case freedom of the press trumps freedom from religious persecution, aware as they are of the not-so-subtle double standards concerning the protections afforded to different religious groups. Take, for example, the impressive strides made in Europe to protect against anti-Semitism, to the point that it is now against the law in some European countries to publish or publicly express any denial or downplay the horrors of the holocaust. Why should the same high standards of sensitivity and respect not apply to Muslims, who are at least equally represented as Jews in Europe? When you study offensive Danish cartoons, it's almost as if old Third Reich-era anti-Semitic cartoons have been simply dusted off and recycled, using a Muslim name instead of Jewish ones. Can freedom of expression - or any freedom for that matter - be absolute? To be sure, democratic societies must be ever vigilant to protect free speech against the constant temptation of censorship and intolerance - be it religious or secular. At the same time, let us remember to never cross, if we can help it, the line into hateful bigotry in the name of an abstract absolute. In other words, the freedom to swing your Islamophobic fist must stop at my Muslim nose.